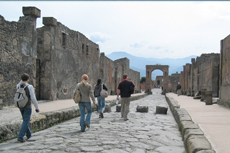 Tour the winding roads, ruins and architecture of Pompeii, the ancient town within modern day Naples that was lost in the eruption of Mount Vesuvius. Small group personal service with a knowledgable guide much cheaper than MSC product.easy to book on line and meet and greet was easy. Our Taxi driver-Ciro arranged this for us. So much information was given, it was hard to process everything. Headsets weren’t very good and kept losing connection. This was part of the same tour as Amalfi coast. If you can&apos;t walk on uneven surfaces or up hills; don&apos;t take this tour. If you can&apos;t walk on uneven surfaces or up hills; don&apos;t take this tour. If you can, you will be transported into another time. Incredible history in both Sorrento and also Pompeii. Just had a couple of hours there at the end of our day round the Amalfi Coast but what an amazing place to visit, very sad when you think what happened there, but incredible how well it has been excavated and preserved. Totally awesome place to see. Totally awesome place to see. It rained while I was there but I didn’t even mind, I was totally lost in the history. There is also a great pizza place across the street from the main entrance. We started by visiting a cameo factory. This was for us the entire point of the cruise- a life long goal to stand in Pompeii and see it. Excellent! Luca - the tour guide, took great care of us, ensured we were all accounted for, and was very knowledgeable! Thanks! We did the Pompeii with tour guide. I found the tour very interesting and good value for money. I found the tour very interesting and good value for money. We purchased while on offer through the celebrity web site. It was very hot and there was very little shade. Glad i took a hat. The tour guide was excellent and very informative. HOT and lots of walking but you can&apos;t go to Napoli without checking out Mt Vesuvius and Pompeii! Another highlight. Learned so much about Pompeii. I encourage folks to read the descriptions of these excursions carefully. People with us seemed surprised at the amount of walking and how rough the terrain would be. Highly recommend. Guided tour (inside the entrance) is expensive (120 euro for 2 hours), but very much worth the money - everything we saw with the guide we did not see when we had visited previously on our own without a guide. Booked tour with Rome in Limo. Booked tour with Rome in Limo. Rosemary, our Tour guide met us in the afternoon prior to going back to the ship. She was excellent and took us around Pompei and explained quite a bit. Happy we paid for a tour guide to get her knowledge.